Extreme Picture Finder is software for Windows which allows you download all images from website automatically and very fast. Simply enter the website address, select the folder where all downloaded images must be saved and click Start! And that's all. Now you can switch back to other tasks while Extreme Picture Finder works in the background extracting, downloading and saving all those images. The example below shows you how easy it is to download all images from a website automatically with Extreme Picture Finder and how to avoid downloading small images (like thumbnails or banners). So, first of all you have to create a project in Extreme Picture Finder using menu item Project - New project... or click the button on the program toolbar and you will see the New Project Wizard window shown below. 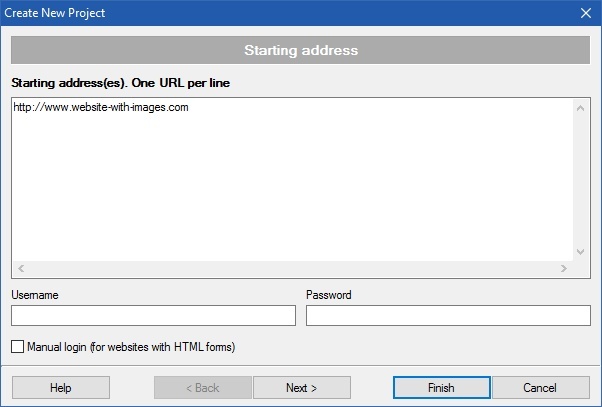 Now paste or type the website address in the Starting addresses field. If this site is password-protected - enter a valid username and password. And if you have to log into the website through one of the website pages, then check the Manual login box. Basically, this is it. The default project settings are set to download all images from all pages of the site, so you can now click the Finish button and start viewing the downloaded images in the built-in image viewer. By default Extreme Picture Finder will download all images from a website - big and small. But in most cases you need only big or full-size images. You do not want thumbnails, banners or parts of the website design. So instead of clicking Finish button after entering the website address, click Next button several times to reach the last step of the New Project Wizard. 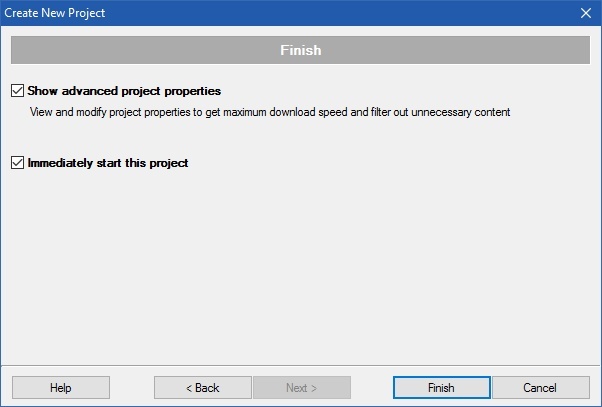 Now check the Show advanced project properties box and then click Finish button. You will see the Project properties window where all project details can be modified. In the Project properties select the Limits - File size section. This section allows you set the minimum and maximum file size of the images. So check the Do not download small target files, less than box and enter 50 in the corresponding edit field. 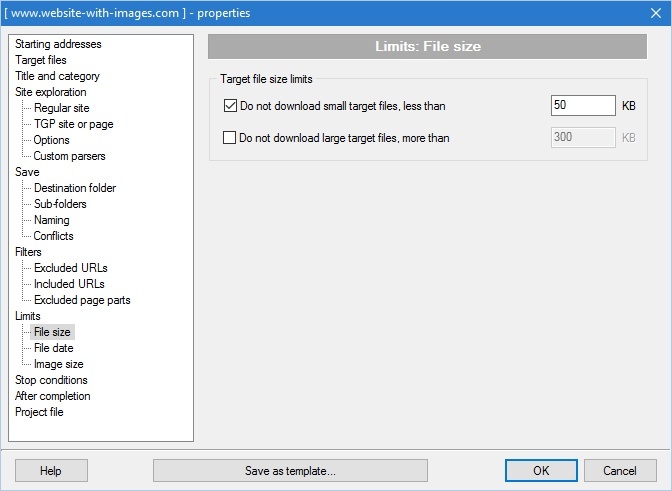 Also you can prevent the download of huge images by specifying the maximum file size. Now you click OK button and Extreme Picture Finder will start downloading only big images. The default project settings may not work on some websites, but Extreme Picture Finder is very versatile. It offers many different ways to make the download process fast and efficient including Custom Parsers, Regular Expressions and Filters. And we have created a library of project templates for various websites. You can search for project settings template by entering your URL into the search box or simply browse through all existing templates. So if you have problems downloading from a website - please contact us with the website address and we will help. Or browse the product forum where we already helped with hundreds of websites.